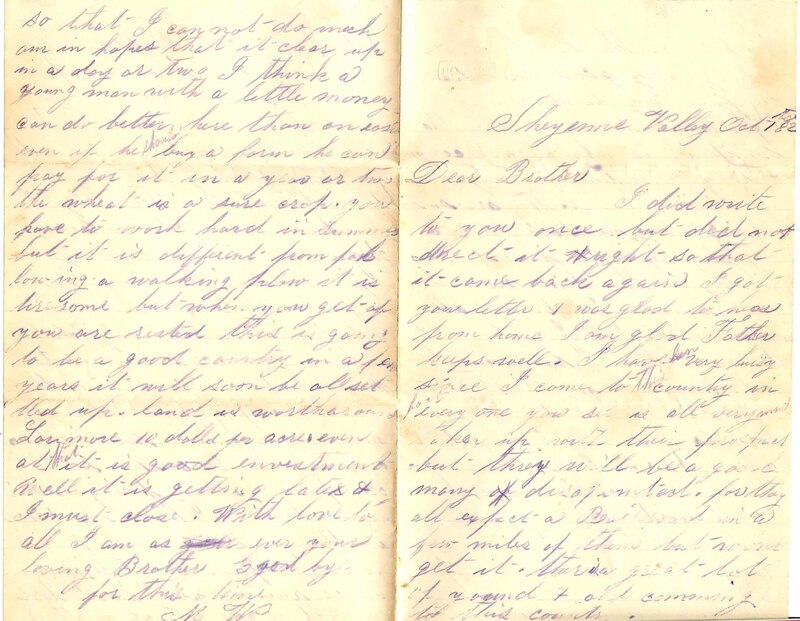 A January 1870 letter written by my 2nd great grandfather Francis Woodruff (1820-1883) to my great grandfather William Earl Woodruff (1848-1928) is a joy to read. It reflects the love and warmth of father for son and gives insight into the goings on in that little part of the Woodruff family 143 years ago. William, it appears, was trying his hand at wool farming out in San Ysidro, California. He was just 21 years old and still a single guy (he married 2 1/2 yrs later), and appears to have gone cross country from his home in Elizabeth, NJ, to work for Hedden Bruen, possibly the John Hedden Bruen (b. NJ about 1815) who appears in Santa Clara County voting records from that period. The letter mentions a “Charles and Sarah” and I’m quite sure this was a reference to Charles Woodruff (1814-1898), a first cousin of Francis’ (they shared Enos Woodruff as their grandfather). 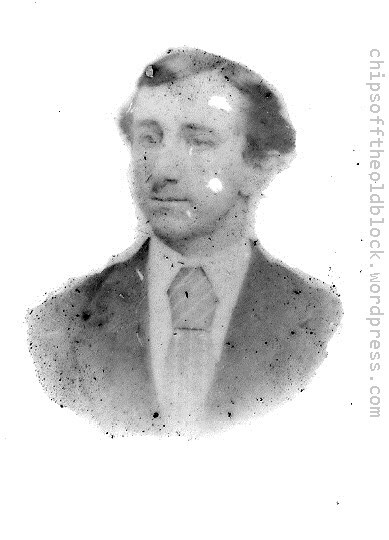 Charles was married to Sarah E. Bruen (1821-1899), so I imagine that Hedden was likely one of Sarah’s brothers. 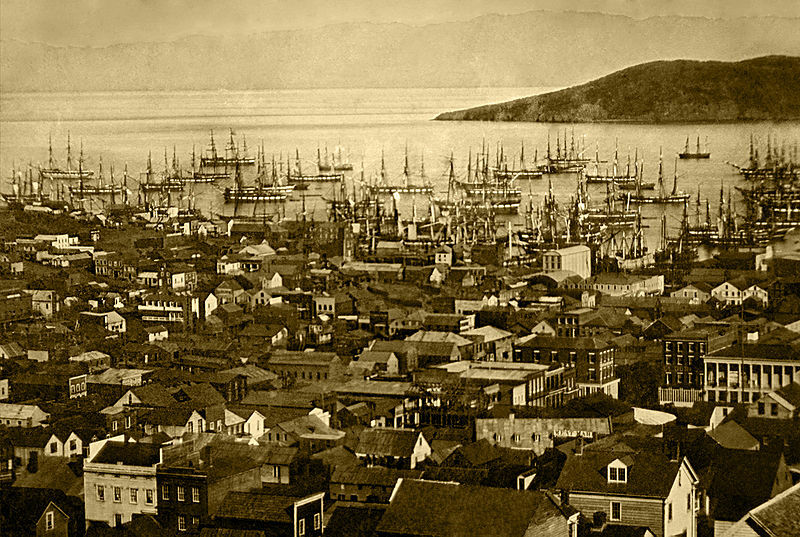 California had been a state for almost 20 years, and the transcontinental railway had been completed a year prior, in 1869, an event that heralded a huge influx of visitors from the east. The letter gives an indication of that at one point in reference to the large number of New Jersey folk wandering about San Francisco. This was a long way from home for William, and to his parents, it probably seemed like he’d gone to the edge of the Earth. But at least they had the ability to communicate via letters. 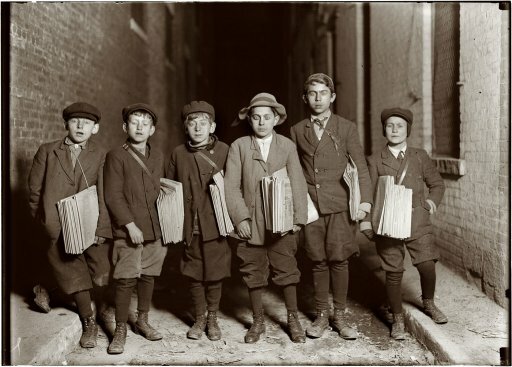 How exciting it used to be to get letters in the mail! I can only imagine how exciting it was for them, especially given that the telephone was not yet an option. I don’t have any more information about William’s life out West, but I do know he was back home in New Jersey in time for the June 1870 census. What happened between then and his June 1872 marriage, I’ve no idea—perhaps, he went off to dabble in whale fishing like the young man mentioned in the letter? I kind of doubt it—I think that morsel of information would have been passed down through the family! Below is the letter which I have broken into paragraphs and added punctuation for ease of reading. Comments, corrections, and additional information always welcome. Be sure to click on the Henry Winslow link when you get to it. We received your letter yesterday and was glad to hear that you were well. We are getting along here about the same old way. We were not a little surprised to hear of Mr. Bruen’s marriage. I went right down to tell Charles and Sarah. I told them your news from California this time. Sarah guessed right away that Hedden was married and wanted to know all about it: how old his wife was and all the particulars. I told her I was not posted on that score. She had a good laugh over it and I left. We are having a very mild winter of it. So far we have not got any salt hay yet and at present there is no prospect of it. The weather is warm. No frost in the ground. The roads are very bad today. Matt and I dug that stump of an apple tree that the wind blew down last summer and set another in its place. The Mr. Earles are setting their line fence and they have got a well and cellar dug. Things will look quite different around here in a little while with three new houses between ours and Charles’ well. Will, I was going to answer your letter right away as you see from the date but I did not intend to be so long about it. It is now the 30th January and no frost yet. I was at Mr. Jones’ auction the other day and saw a young Sparks [?]. He said he had a letter from his brother. He spoke of your being in San Francisco with him. He said he learned more about the Jersey folks than he could write in a month. I have had a bad cold and was a most sick for a few but am better now. I was afraid I was going to be lame again but have escaped so far pretty well. Phebe has had a slight attack of scarlet fever but is getting better so that she is up today. Matt has gone to Newark for a load of grain with three horses. You know that suits him to make a show with the team. We have a good one now. You write about going out tending sheep and as it is Mr. Bruen’s avice [sic] I have some faith in it. It is quite a new kind of life for you but if there is a chance of doing anything worth while and you have a mind to try it I have no objection. But you must do as you think best. You are your own man now and must choose for yourself. We cannot advise you anything about it because we don’t know any of the circumstances. 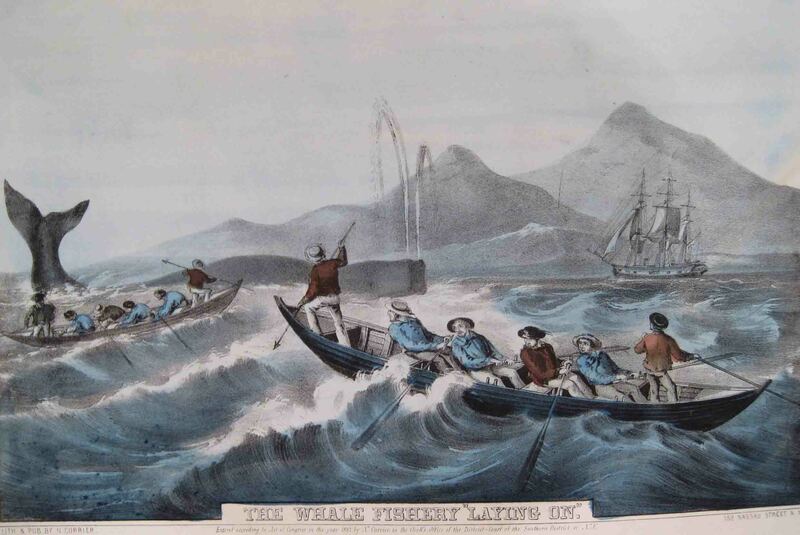 Your Mother thinks it is a wild scheme but I do not think near as bad as whale fishing that Henry Winslow tells us about. By the way he has been here and made us quite a visit. He is a stout fine looking young man. I think he looks something like his Uncle Hedden. He tells us some great whale stories. We were telling about your talking of going round the world. He said if you once got on the water you would never leave it. You must write as soon as you can and tell us about the country you are in and about wool growing. It would be very pleasant to have you with us here again but if you have a mind to try your luck I’m just as willing to do anything I can for you there as here. I have great confidence in you and think Mr. Bruen would not advise anything but for your good. Mother says give her love to you and I send my own and all the rest of the family. Tell us how far out in the country you are. 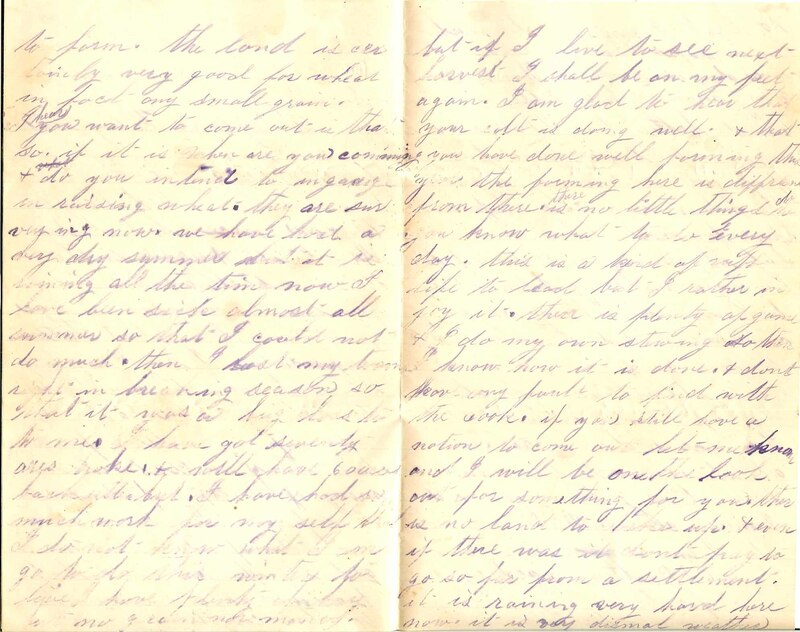 Below is the last letter I have written from the hand of Matthias Woodruff, younger brother of my great grandfather William E. Woodruff. 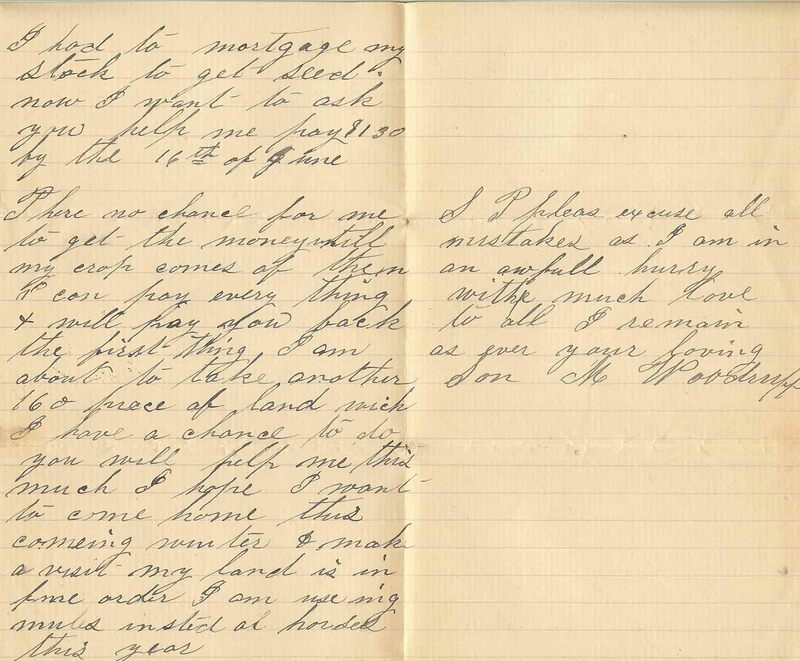 Like the previous two posted, this one is written from Dakota Territory, but this time to William rather than to father Francis Woodruff. For previous posts on Matthias, please search his name using the search box to the right. I did write to you once but did not direct it wright so that it came back again. I got your letter and was glad to hear from home. I am glad Father keeps well. I have been very busy since I came to this country. in fact everyone you see is all very [?] taken up north their prospect but they will be a good many of disappointed [?] for they all expect a real road [?] in a few miles of them but won’t get it. there is a great lot of young and old coming to this country to farm. the land is certainly very good for wheat, in fact any small grain. i hear you want to come out. is that so. if it is when are you coming and do you intend to engage in raising wheat? they are surveying now we have had a very dry summer [?] but it is raining all the time now. i have been sick almost all summer so that I could not do much. then i lost my team right in breaking season so that it was a big loss to me. I have got seventy acres broke and still have 60 acres backsett [?] but I have had so much work for my self that I do not know what I am going to do this winter for [?]. I have plenty of hay but no grain nor money. but if I live to see next harvest I shall be on my feet again. I am glad to hear that your colt is doing well and that you have done well farming this year. the farming here is different from there. there is no little things you know what to do every day. this is a kind of ruff life to lead but I rather enjoy it. there is plenty of game and I do my own stewing so then I know how it is done and don’t leave my fault to find with the cook. if you still have a notion to come on, let me know and I will be on the lookout for something for you. 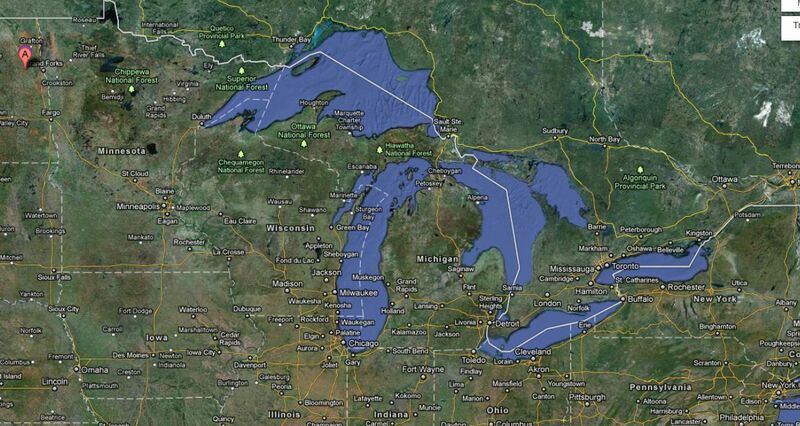 ther is no land to take up and even if there was it don’t pay to go so far from a settlement. it is raining very hard here now. it is very dismal weather so that I cannot do much. am in hopes that it clears up in a day or two. I think a young man with a little money can do better here than on east even if he should buy a house he can pay for it in a year or two. the wheat is a sure crop. you have to work hard in summer but it is different from following a walking plow. it is tiresome, but when you get up you are rested. this is going to be a good country in a few years. it will soon be all settled up. land is worth around Larimore 10 dollars per acre even at that it is a good investment. Well it is getting late & I must close. With love to all I am as ever your loving Brother. Good bye for this time. Before I get to Matthias, I wanted to say that you may notice the change to my WordPress theme. 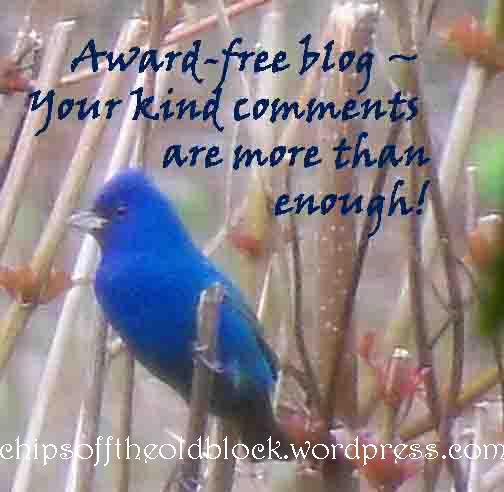 The old one had some sort of bug that would not allow me to limit the number of blog posts per page. And that was becoming very annoying (for me, anyway). This new one is much better in that regard though I am still getting used to it. The certificate says the death occurred in Chatham, Morris Co., NJ, and that Matthias’s residence was located in Madison (next town over). You may recall that Madison is where Isaac Ayers, Matthias’s brother-in-law, ran a grocery store. How terribly tragic for the Woodruff and Ayers families, and I can’t help wondering whether the below group photo may have been taken on the occasion of the funeral (Matthias’s brother William, my great grandfather, is shown standing on the right). It fits the timeline, though I can’t remember whether NJ looks that wintery in early April. 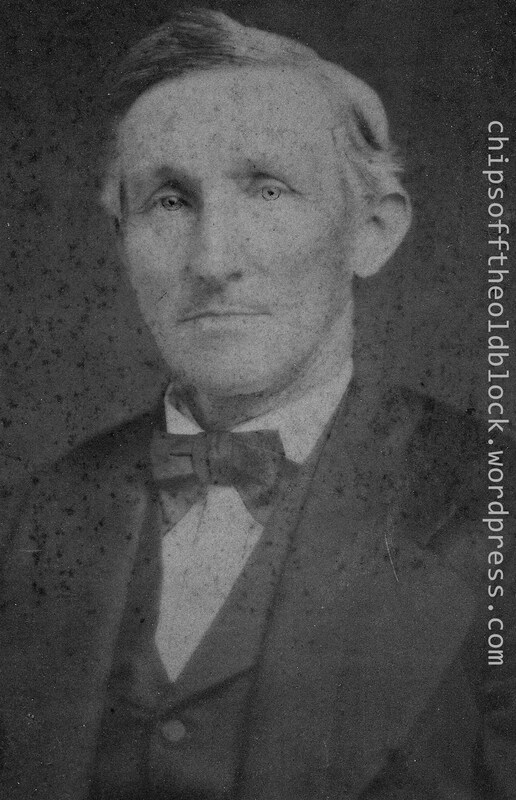 Matthias was buried at Evergreen Cemetery near his parents, Francis and Mary (Trowbridge) Woodruff, who passed away in the early 1880s. Unfortunately, I don’t know the circumstances of his injury, and I am not sure how I would go about finding that out. Was this an industrial accident? A road accident? What happened to his land in Dakota is a mystery. Had he sold it by then, or was he just home visiting before heading off to begin his spring planting? 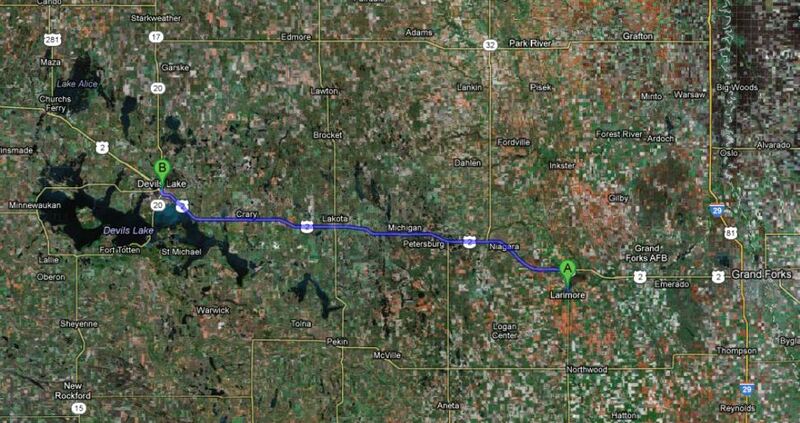 If I were on the TV show, Who Do You Think You Are?, I would be saying, “Guess I’m going to North Dakota” or “I’m off to Chatham, then.” But alas, such travels are not in the cards for me any time soon! 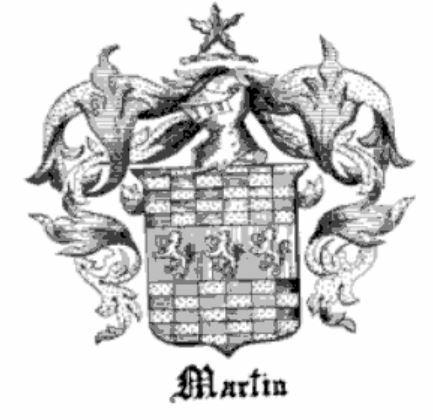 Perhaps, someday a descendant of Matthias’s son Frances will contact me via the blog to provide some clues. Lots of land available per this paper. I wonder whether the Woodruff highlighted is any relation to Matthias. 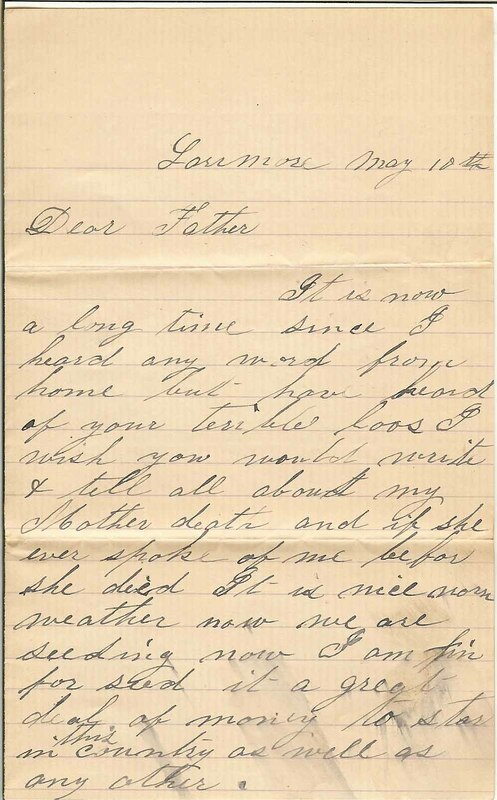 Little did Matthias Woodruff know that his father would pass away a month after he sent the below letter off to him from Laramore, Dakota territory, in early June 1883. 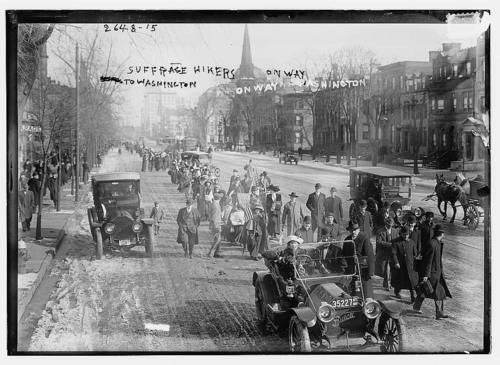 The arrival of the railroad in that neck of the woods spurred many to seek their fortunes there. I assume that was the lure for Matthias. You will see from his letter that by 1883 he had accumulated 320 acres of land and was farming wheat. At the time, he was 32 years of age and he had been married to Mary S. Ayers for 11 years. Their son and only child, Frances, would have been just eight. I have no idea when Matthias left Dakota permanently. Perhaps he never did. Maybe he spent winters back east in New Jersey with his family who were probably living with Mary’s father and mother (Ezra and Mary Ayers), and spent the planting and harvesting season in Dakota. All I do know for sure is that he was to live just nine years more, as he died in New Jersey on April 6, 1892. I have been unable thus far to find him in the 1890 census; that record may provide some interesting clues. In any case, amazingly this half-in-pencil, half-in-ink, 130-year-old communication has survived, and here I am now ready to share it with you. It offers an interesting glimpse into the life and trials of a frontier farmer. Francis, his father, was very well off, so it would be interesting to know whether he supported Matthias in this venture. Francis’s will, if we could track it down, would probably be quite revealing. I got a letter from you the other day and was very glad to hear that you were in such good spirits. There must certainly be a great change in your house [wife Mary Jane had recently passed away] but it the change that we all must experience sooner or later. I have also undergone a great change to leave all that was dear to me on earth and come out here to this country. When I first came I was sick a long time but last winter froze it out. I am in excellent health now. It is a healthy climate. you spoke as if you had money you would come and make a visit. it would do you good & I would like to have you see the difference between east and west. I mean the way of living and farming. I am afraid the water would not agree with you. I have now three hundred and twenty acres of splendid wheat land. All I want now is to get it broke in. then I can live at my ease. I earned a good deal of money this winter with my team but had to lay it all out for seed. I have sixty acres of wheat in and fifteen of oats, so you see I will have quiet a harvest but there is a time from now until harvest that I am very poor and I want to stay and break all I can for there is where all the money in this country is. I will have money enough this fall to pay all my debts & come home too if I could have $150 within a week or two so a to save my team. If I do not get it, they will be sold so help me this time please. I can pay it all back in September. Then I will market my wheat. P.S. Please don’t disappoint me this once I have written for my wife to help but they are poor too and refuse to help me. I have just come in from my day’s plowing. 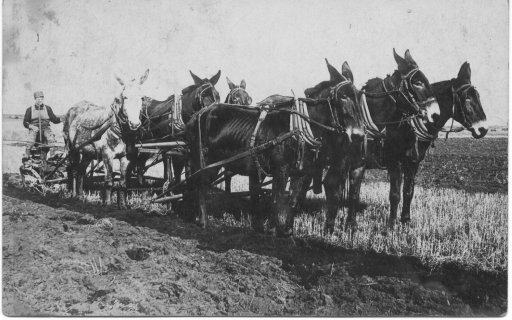 I use two mules and one horse to plow and it makes nice work. We keep our plow sharp as a knife. I plow through sollid strawberry plants that are now in full bloom they cover the ground in some places. Lots of land available per this paper. I wonder if the Woodruff highlighted is any relation to Matthias. 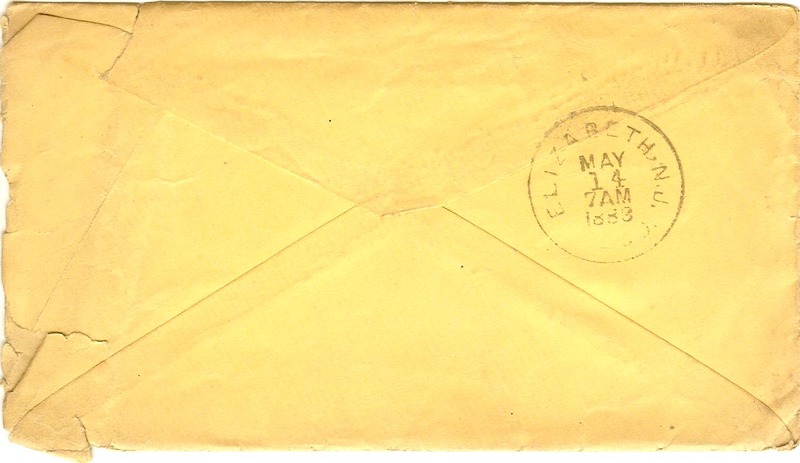 Imagine mailing a letter with such a simple address, expecting it to get there, and it does! 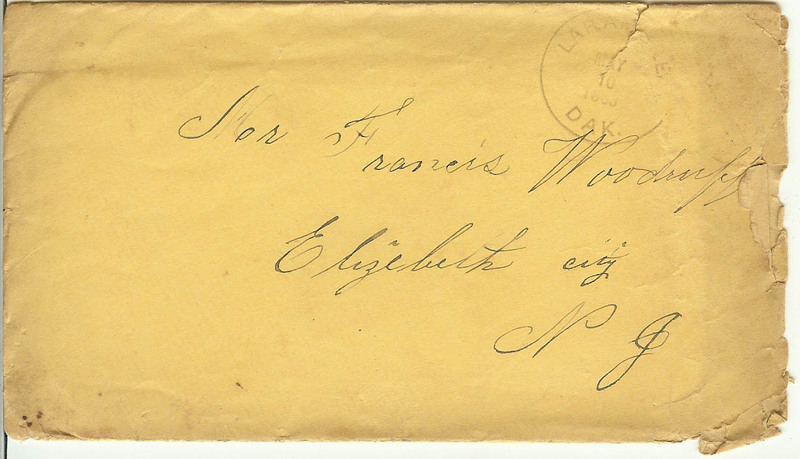 Below is a letter written on May 10, 1883, by Matthias Woodruff to his father Francis Woodruff. 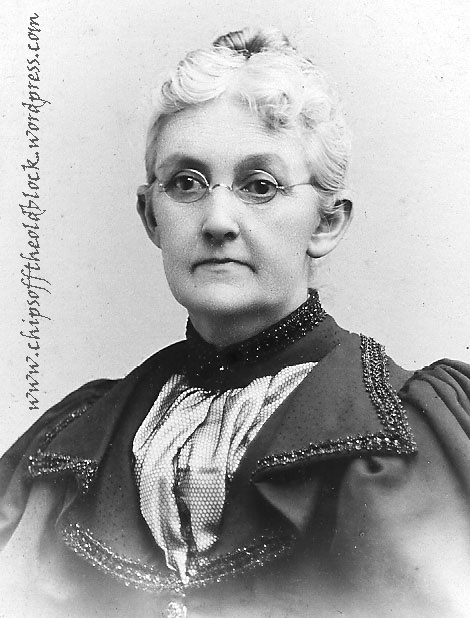 Matthias’s mother Mary Trowbridge Woodruff passed away earlier that spring (in March). Francis passed away two months after the letter was written. 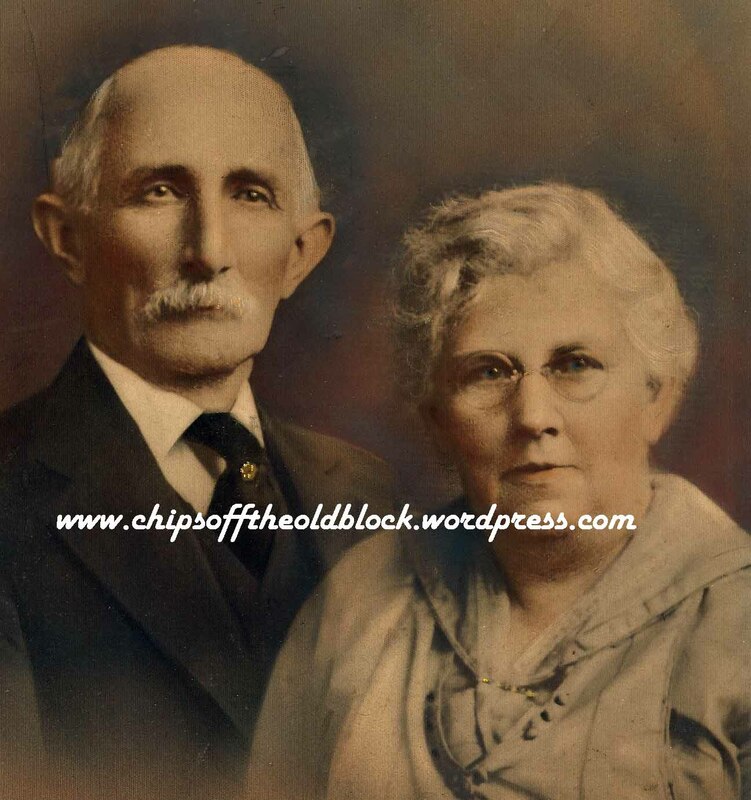 Both parents were in their early sixties. 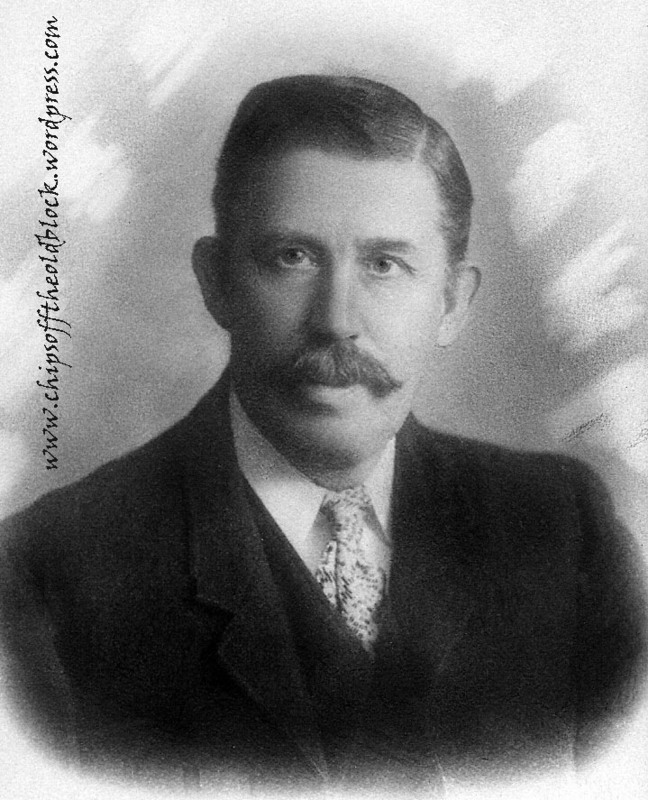 Matthias was writing from Larimore, North Dakota, a town founded in 1881. 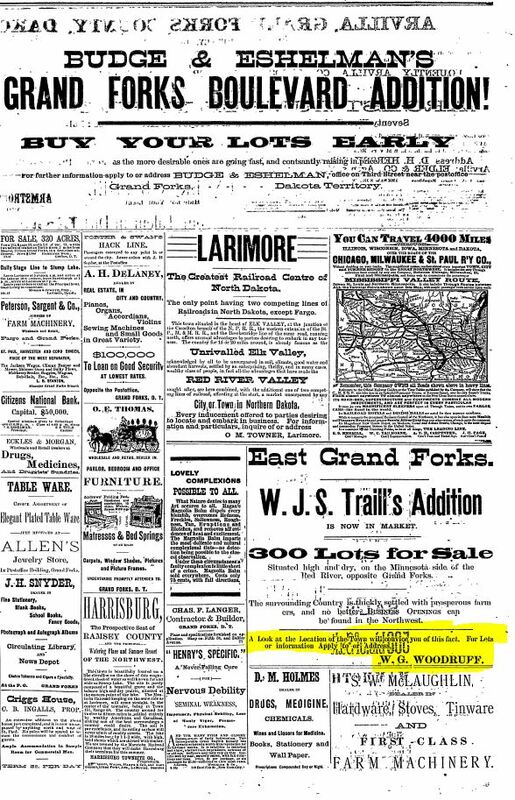 In 1883 there must not have been much to Larimore. 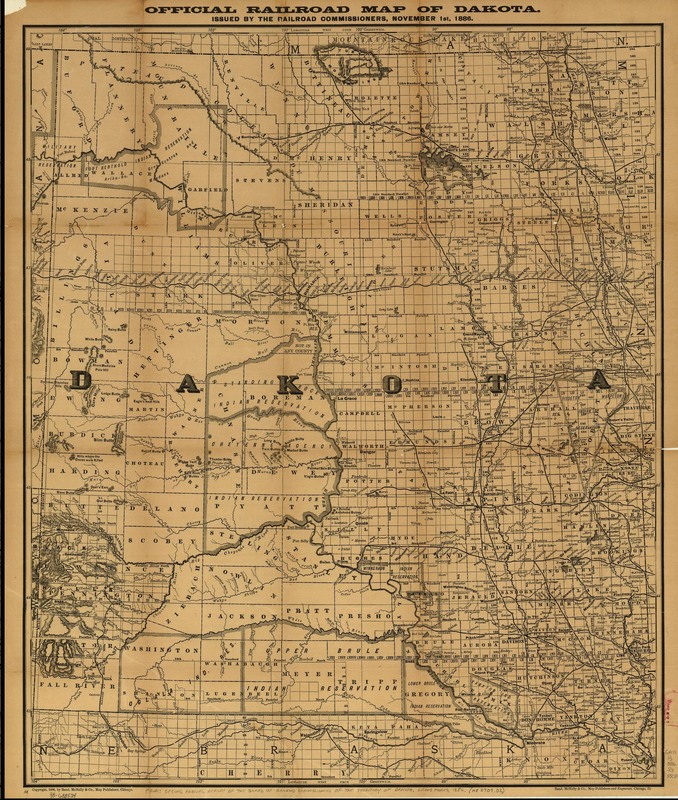 North Dakota obtained statehood in 1889, and at the time of the 1890 census, the population was just 553. He was on his own out there–far away from his wife Mary and son Frances (mentioned in previous post). I gather he did not get back East very often. I have another, longer letter that I will post in the near future. 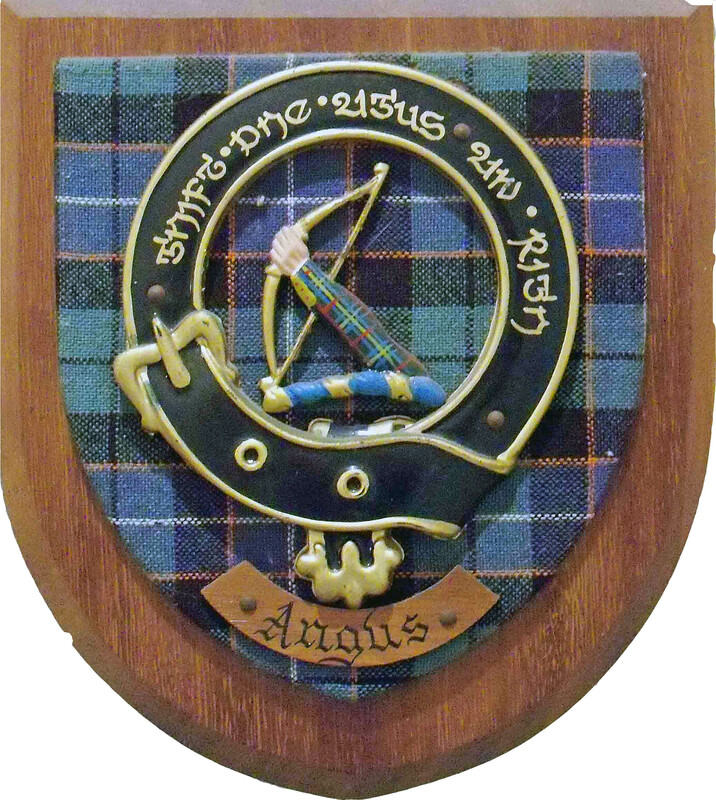 It is partly in pencil and there is some smudging, so it will take time to decipher. P.S. I have added some punctuation since it is largely missing in the letter. The spelling and grammar are his. On March 16, I posted an update on members of the Francis Woodruff family. There were four children: Emma (b. 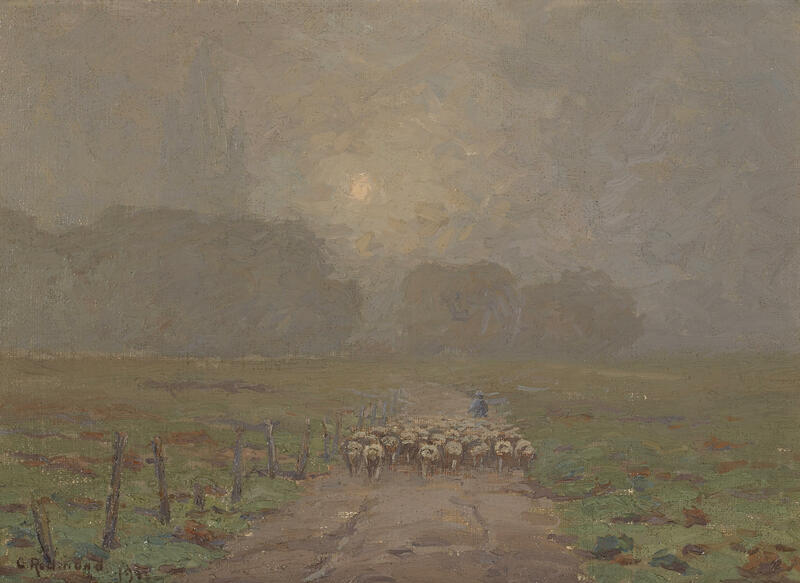 1846), William (b. 1849), Matthias (b. 1851), and Phebe (b. 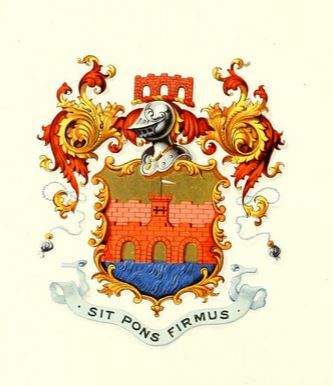 1855). You may recall that Phoebe and Matthias had married siblings from the Ezra Ayers family: Phebe married Isaac J. Ayers, and Matthias married Mary S. Ayers. I did a bit of digging on the Ayers family and emerged with the below family tree. There were nine children in all! In August 1850, when Ezra was 29, he and his wife were living in Woodbridge, Middlesex Co., NJ, with Sarah (age 4) and Isaac (age 2). 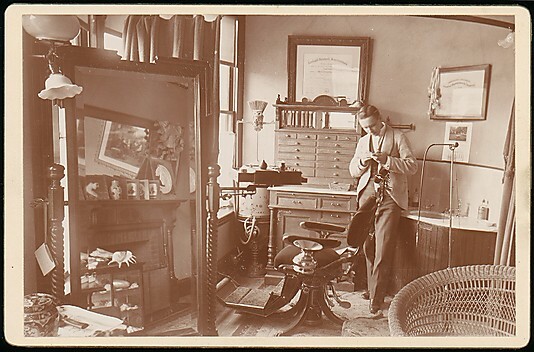 His occupation is listed as a tailor and he has declared real estate with a value of $1,200 (roughly $35,000 today). He was born in NJ, while his wife was born in England. I hit pay dirt with the 1870 census (both records freely available on Family Search, by the way) which shows the couple with all nine children living in the Tenth Ward of Newark, Essex Co., NJ. Isaac is 48 by now and listed as a retail grocer. His real estate is now valued at $12,000 (nearly $210,000 in today’s currency) and his personal estate at $1,500 (about $26,000 today). Wife Mary is still “keeping house” (with nine children, I can’t imagine what else she would be doing! ), but now daughter Sarah (24) is a clerk in a “Fancy Store” and Isaac (22) is a “Grocers Clerk”, likely in his dad’s store. Son Francis is 19 with no occupation listed for him. In school are Mary (16), Emma (14), Joseph (10), and Elizabeth (8). Little Annie, age four, born when mother Mary was 41, is still at home. Interestingly an Isaac Jones is also in residence. He is 76 and listed as born in England, so it seems likely he is Mary’s father. The census shows that her mother was born in England as well. How the Ayers and the Woodruffs became acquainted, I do not know. Francis was a farmer so perhaps he sold his produce at Ayers’s market. In any case, it was not long after this 1870 census that the two marriages–those of Matthias Woodruff to Mary S. Ayers, and Isaac J. Ayers to Phebe Woodruff–took place. Although Phebe is the younger of the two Woodruff siblings, I’ll begin with her. 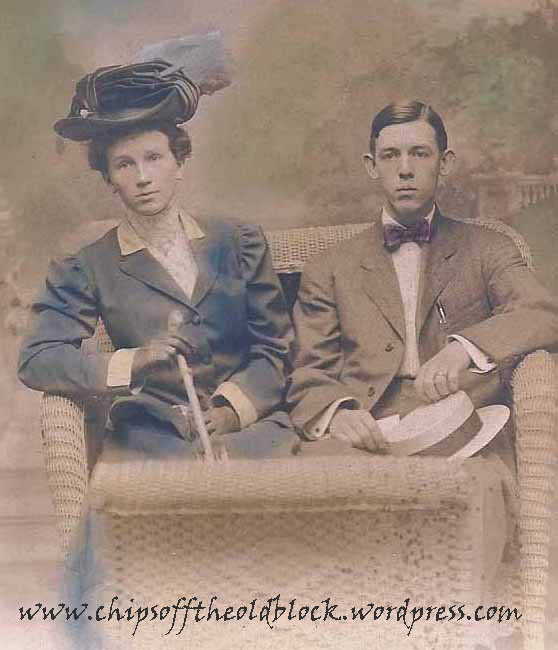 She (19) married Isaac Ayers (26) on October 23, 1874, in Union, NJ. A Google search on Isaac J. Ayers name revealed a website for a restaurant at 13 Waverly Place in Madison, NJ, called Poor Herbie’s. 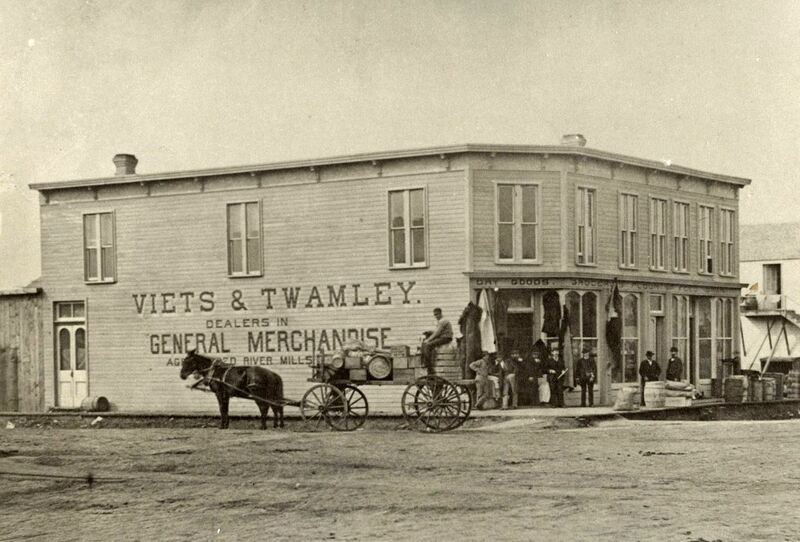 Their website information reveals that the building their restaurant is located in was operated as a grocery store by Isaac J. Ayres in 1877, the year a major fire destroyed a large commercial area. The fire allegedly began in that very building. 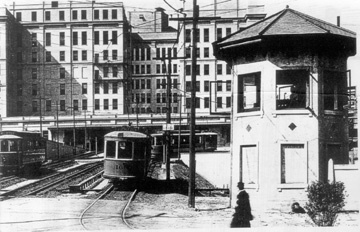 [For an image of the building as it appears today, click here. Poor Herbie’s is on the left.] Isaac remained in the grocery business; the 1880 census lists him as a grocer in Newark, NJ. 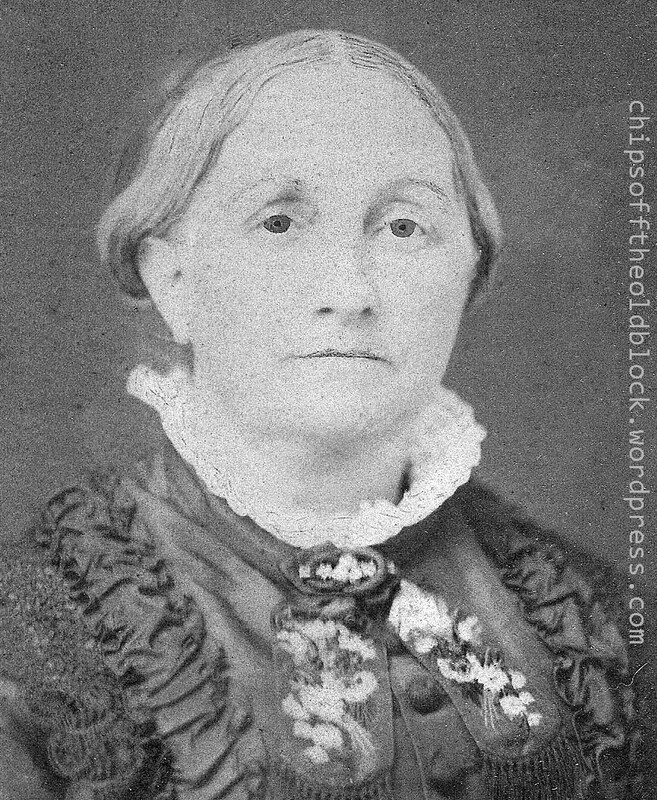 Isaac and Phebe Ayers had four children: Anna W. (b. 1875), Charles S. (b. 1878), Amy M. (b. 1888), and Isaac Jr. (b. about 1880). Only the older three children appear in the 1900 census, so I gather Isaac Jr. must have died young. The 1900 census lists Isaac Sr. as a farmer who owned his farm free and clear. Anna (24) is not working, Charles (22) is a real estate clerk, and Amy (11) is at school. Ten years later (in 1910), the census record shows Isaac still as a farmer in Union, NJ. The record says at “Truck place”–I have no idea what that means, but he is listed as an employer. Wife Phebe and daughter Annie (34) are at home, while daughter Amy (21) is listed as a public school teacher. That is, thus far, the extent of what I know about this family. Now, back to Matthias (b. 1851), who greatly intrigues me; he married Mary S. Ayers (b. 1853) on November 21, 1872, in Newark, Essex Co., NJ. They had a single child, a son, Frances, who was born about 1875. Matthias died on April 6, 1892, in Chatham, Morris Co., NJ, in the couple’s twentieth year of marriage. So what was going on with Matthias for those twenty years and why did he pass away relatively young? I could not find him in 1880 or 1890 census records. 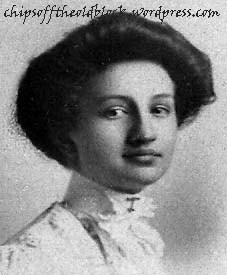 I did find Mary in 1900 and 1910, but, of course, by then Matthias was already long gone. In 1900, Mary (47) is back living with her elderly parents, Ezra and Mary Ann Ayers, and sister Judith E. Ayers (36). Their residence is listed as 130 Elm Street, Newark City, NJ. Ezra, 76, is listed as a dealer in dry goods, owning his own home free and clear. Mary states all 9 of her children are still living. This time she lists herself as born in England and her parents as having both been born in Wales. By 1910, Ezra must have passed away. Mary, 85, is listed as the head of the household at 130 Elm Street. Once again, she lists all nine children as still living. 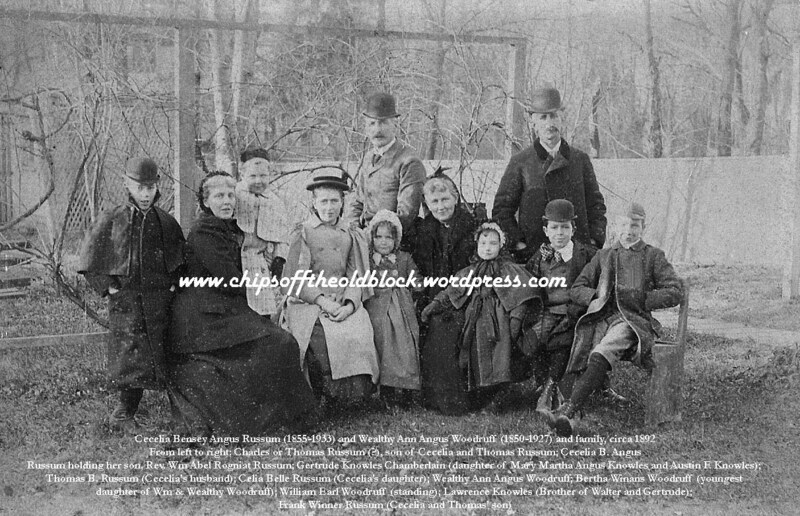 Matthias’s widow, Mary Ayers Woodruff (now 56, working in dry goods, store retail), is still living there, as is her son Frances, age 35, single, and a dentist. Also resident are daughter Emma J. Brown, a widow, aged 50, working as a sales woman in dry goods; daughter Judith E. Ayers (44; single, no occupation); daughter Annie M. Ayers (40; single, no occupation); and a 17-year-old servant named Helen Lannigan. Matthias’s son Frances would have been 17 when he (Matthias) died. 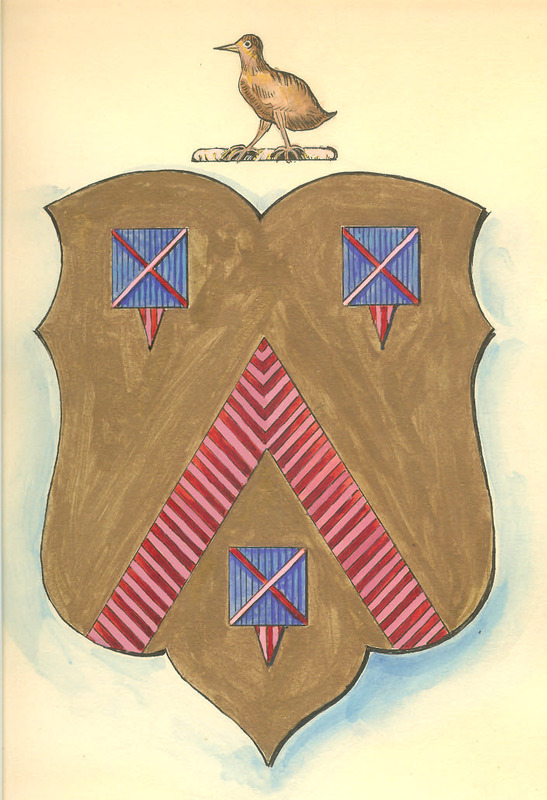 Perhaps Frances’s path to dentistry was owed to his great uncle John Dickinson (a dentist) who was married to Emma Woodruff (Francis Woodruff’s sister and Matthias’s aunt). What happened to Frances? I gather he never married, but who knows, maybe we will find out differently. I found a death record for a Frances Woodruff born on August 18, 1874. 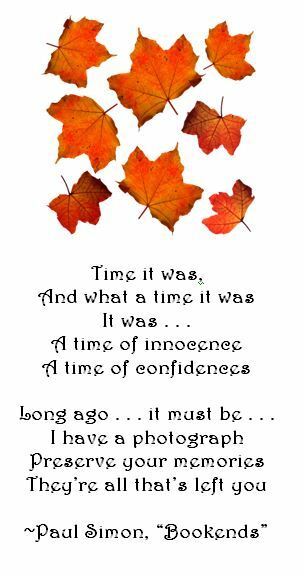 If this was “our” Frances, he lived to the ripe old age of 93, passing away in February 1967 and last residing in Orange, Essex, New Jersey. But, I’ll need to see the death certificate to know for sure whether that’s him. 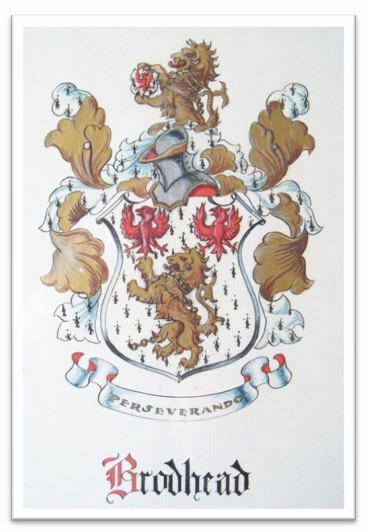 Relevant to Matthias’s whereabouts for those twenty years of marriage, I recall coming across some letters a long time ago that revealed a bit about Matthias’s relationship with his father Francis Woodruff. Matthias wrote the letters either from Wyoming or North Dakota. As I recall he talked about farming wheat. Perhaps Matthias was working land out there to support Mary and Frances, but the way he spoke in the letter, it sounded like he had a boatload of kids to support, but now I know there was just Frances. He also, as I recall, asked his dad Francis Woodruff for money. I will try to find those letters and include them in the blog. Well, enough for today. Until next time!